LONDON (Reuters) - U.S. oil production growth combined with a slowing global economy will put oil prices under downward pressure in 2019, challenging OPEC's resolve to support the market with output cuts, the International Energy Agency said on Friday. "The impact of higher oil prices in 2018 is fading, which will help offset lower economic growth," the Paris-based IEA said in its monthly report. Oil <LCOc1> rallied above $85 per barrel in the second half of 2018 on concern about lower supplies from Iran due to new U.S. sanctions. 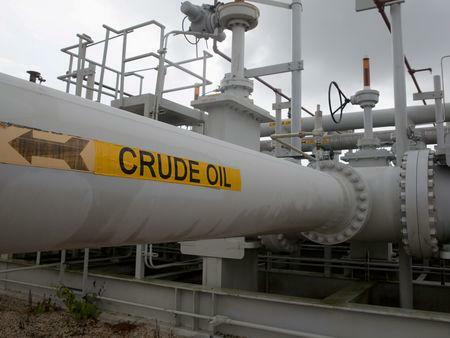 But crude fell towards $50 at the end of 2018 due to an economic slowdown and rising U.S. supply, prompting producer group OPEC to cut output in an effort to keep prices above $60. The IEA said global oil supply last month fell by 950,000 bpd, roughly 1 percent, led by lower OPEC output even before the organization's new supply-cutting pact took effect in January. The IEA said non-OPEC production growth was set to slow to 1.6 million bpd in 2019 after record annual gains of 2.6 million bpd in 2018. However, the United States will continue to surprise on the upside. "The United States, already the biggest liquids supplier, will reinforce its leadership as the world's number one crude producer. By the middle of the year, U.S. crude output will probably be more than the capacity of either Saudi Arabia or Russia," the IEA said.